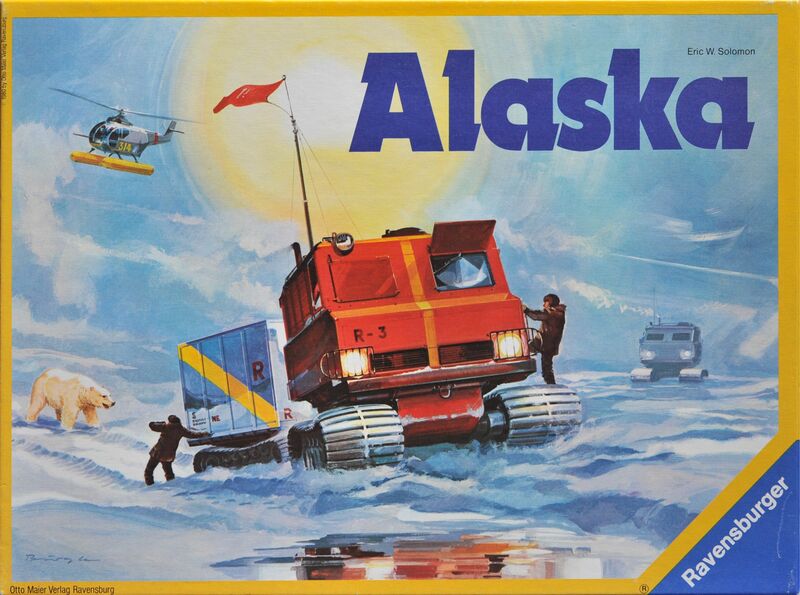 Players compete to collect their container blocks from a central island and return them across the ice sheet to their respective camps before the Spring thaw. The game runs in two parts; Winter as the players lay ice tiles across the hex board to the central island, and Spring as the thaw allows the players to remove ice tiles. In your turn, you draw from deck 1 which shows a 1,2 or 3 hex tile and a number on the winter/spring header/footer. After placing the tile in the hex-board, you then drawer an action card from deck 2. Most are played immediately (Polar Bear, Frostbite, Found Container) but others you can save and use later (Robbery, Fog, Helicopter). Then the player can move their truck up to free places. A 3-hex ice tile counts as one space, so a player with a shorter route may profit early, but when the thaw comes, the other players can quickly remove the shortcut. The Polar Bear acts as a barrier and is often moved around. The other action cards can be beneficial (Found Container means you simply put a container in your truck where you are) or hinder you (Frostbite means you must drop the container and your truck jumps to your camp). Players can only rob dropped containers, not other trucks. The Spring thaw only comes when all the ice tiles that can be placed are down. You keep using deck 1, but simply read the alternate symbol for the thaw. There are fewer thaws, so the ice sheet stays active for some time, forcing players to make longer detours. You cannot remove an ice tile if it holds a truck or the bear, and tiles with dropped containers only go last. The game sort of stops when no containers can be collected, but since Helicopter action cards allow you to jump from place to place, the actual end-point is not precise.